Some of you probably saw my facebook status last week about pledging to go screen free from 29 April to 05 May 2013. Well, I was blog hopping, reading some of the wonderful & inspirational posts when I chance upon Screen Free Week Challenge and I thought "What a great idea!" I clicked the link and soon I was lead to CCFC or Campaign for a Commercial-Free Childhood website. Look at the name, I am sure many of you will have the same reaction as me; sit up immediately, eager to learn more about this. So what is Screen Free Week Challenge? So in brief who or what is CCFC? "CCFC’s mission is to support parents’ efforts to raise healthy families by limiting commercial access to children and ending the exploitive practice of child-targeted marketing. In working for the rights of children to grow up—and the freedom of parents to raise them—without being undermined by corporate interests, CCFC promotes a more democratic and sustainable world." "CCFC was founded in 2000 by Susan Linn as an activist response to the rapidly escalating problem of commercialism encroaching on the lives of children." "From a small group of concerned parents, health professionals, and educators CCFC has grown into a powerful force, working through every legal means possible to end the exploitive practice of child-targeted marketing so that children can grow up—and parents can raise them—without being undermined by greed." Wow! I am sure many of us feel the same too about companies using advertisements that target children and using them as a tool (if I may say) to get their sales number up up UP. So we took the Pledge! This campaign is in USA, I did a quick search and did not see Screen Free Week activities any where in our region; I probably have to do a more intense search later. So I decided to sign up. It doesn't matter if its an overseas challenge that probably would not have any impact here, it is a meaningful cause. 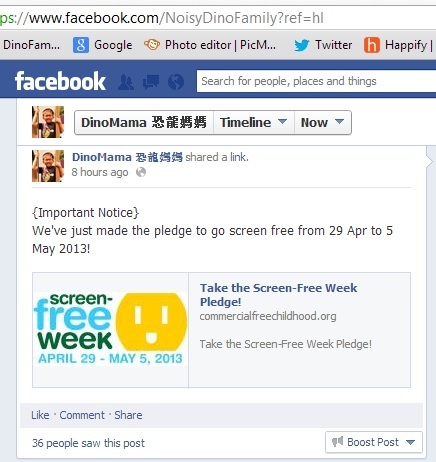 Incidentally we, the DinoFamily has been going screen free on weekdays since 01 April 2013 *Hurray! *, screen time on weekends are about 12 hours which is something we have to work on gradually. So you are interested but still considering? We know how excessive time spent on tv or electronic gadgets are bad for our children but we are all guilty of shoving them onto our children as a last resort when we needed something to distract them from us while we finish up our work/tasks. While electronic gadgets are quick and easy way to let our children to explore and gain some knowledge on their own, in a long run it will lead issues such as obesity, causing harm to eye sights and to a certain level, cognitive issues. How many times have we reprimanded our children for not listening or answering to us with their eyes glued to the tv? Time spent in front of these gadgets prevents the child from leading a healthy & meaningful life, he is cooped up in the house instead of going outdoor for some physical play, or even picking up a book (not ebooks or kindle) to read. Let's face it, we try to reduce the time our children spent in front of these electronic gadgets but its a losing battle, one that most likely ended up with wailing toddlers, angry & unhappy children and worst scenario; a meltdown, a situation where most parents would like to avoid at all costs. To turn this your favour, why not start small? Perhaps by gradually reducing the number hours spent in front of the screen per day and work it up from there? Suggest to your child that you would like to start something meaning and beneficial in the family by doing some activities where every one can participate. Get them involved by asking them to think and suggest some activities. Eager to start but not sure what to do? Here are a few suggestions to get you started. * Board games - You'll be surprise to be able to find board games in the bookstores like Popular, Kiddy Palace or Daiso and they do not cost much too. * Books - Head down to the neighbourhood library and borrow a few books with your library card or your child's Student Concession Card. Each card is entitled to borrow a maximum of 6 books, that's at least 6 days of reading fun! * Playgrounds - A trip to the playground does wonders to children. It not only gives them a chance to exercise, they can also make new friends at the same time too. * Printable activities - There are many sites where you can download printable activities with specific themes or story. Recently we downloaded Charlotte's Web printable worksheets as we will be watching the play next month. A point to note though, some of the websites requires you to set up an account free before you can start downloading the free printable. Having said the above, I would like to add that there are some good and informative programs that are beneficial to our children. We personally like Discovery Kids which show real life adventures or game shows, science, wildlife and nature programs. We enjoy the programs a lot and some times we will look for more information about a particular topic or animal we watched earlier with books or search for more information online. Also, regardless the reason(s) that makes you wants to join this challenge (or any meaningful challenges/causes), please do so with the aim of improving the life or relationship of your family and not because you want to join the crowd. So with a clear direction, lets join in the challenge and have some fun! I've been trying to get Sophie off the screen, hp and ipad but realised that I've been setting a bad example for her as I'm always on the hp myself. But while this is a good idea, I'm not sure how I'll fare so I don't want to set myself up for failure with this challenge. Susan, its always hard to get ourselves or the kids away from all these "temptations". I'll try my best to keep DinoBoy away but sometimes the will power is not strong enough. So long as you limit Sophie's time on the ipad and make sure that she takes a break after 15mins so that the eyes can rest.